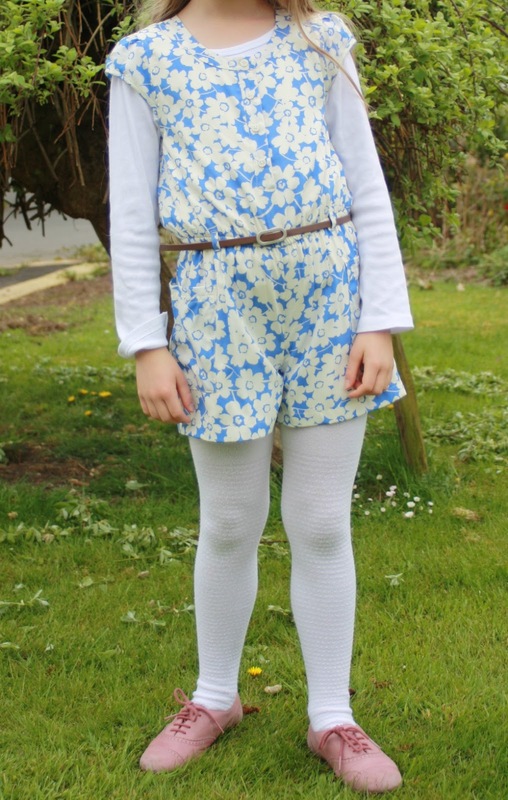 Ever since she was tiny, my daughter has had the ability to adapt her clothes to make them suitable for the changing seasons – a winter dress with socks instead of tights in the autumn, a long-sleeved top and tights under a summer dress in spring or worn with socks and shoes on a rainy summer day rather than sandals. And so on a warmish May day we looked in her wardrobe to decide what she should wear. Finally it was time to say goodbye to the jumper dresses but all she had was VERY summery dresses and playsuits with no sleeves and very short shorts. She wore this M&S Autograph playsuit for the first time. The playsuit is smart, but comfortable and has a little leather belt that she loves. It’s not suitable for 15 degrees and hazy sunshine. Not on its own, anyway. 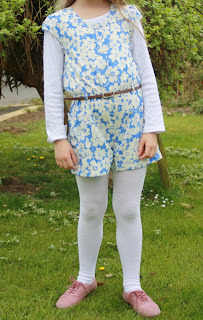 So she added a pair of white tights, the pair which originally came with her M&S autumn shorts outfit They were a bit big for her initially, but six months after she got the outfit, they fit her a bit better. Incidentally the Autograph playsuit is one of the few M&S items which fits her well. Usually we find she is a bit slim for them, but the 7-8 is just right for her. She finished it off with a basic Next white long-sleeved Tshirt, which came in a three pack ages ago and is very useful for adapting outfits like this! Like the way she’s adapted her outfits. 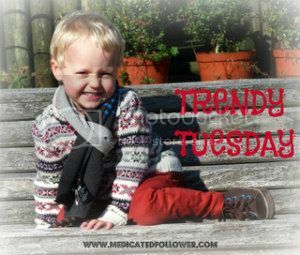 Looks cosy and warm enough to protect from chilly winds with a lovely springlike pattern. Thanks very much, she loves it! She wants to wear it every day at the moment, despite having a wardrobe full of clothes! Really lovely 🙂 I’m a big fan of adapting outfits to temperature and season. Shorts over tights etc..
Funnily enough, mumofthreeboys, she said yesterday she would like to be a fashion designer. She’s always wanted to be a teacher. But she’s only 7, she has years left to decide! Thanks for sharing with us at Creative Mondays..